From milking cows as a kid to his adult role helping youth succeed, Mitch’s path in life so far has been “beautifully strange.” In our latest staff profile you can learn more about this very interesting team member who drives you to drink local. Mitch has been part of the Maine Brew Bus team since April of 2018, serving as a driver aboard many of our tours. He literally grew up working on the family dairy farm in Sabattus, Maine, and has spent his entire life in the Pine Tree State. For about a decade now he has been living in Greater Portland. He works during the week as a Special Educator and is also a part-time graduate student. He loves his work, but finds that the Brew Bus is a nice relief from his daily grind. Mitch’s path started when he was studying towards a Business degree at the University of Southern Maine. At that time he was working in a warehouse, and neither plan really seemed to be working out for him. He switched his studies towards an English major with a Writing minor. Soon he started working as a Special Education substitute, and since then he has never looked back. Now with nine years of work in the public schools under his belt, Mitch finds his vocation truly rewarding. To continue his studies, he is enrolled in a graduate program to earn his Master Degree in Education with a concentration in English for grades 7-12. Last spring he heard about an opportunity to work on the Brew Bus from his friend Sarah. Mitch figured that sharing the amazing Maine beer scene with people from all around the world would be far superior to spending another sweltering period of time teaching summer school. “The craft beer industry seems to be one of the only industries that is insulated from cut-throat competition in the U.S.,” Mitch told me. “Everyone you meet from tasting room managers, to owners, to brewers are all generally interested in helping one another to elevate the industry as a whole. It sounds cheesy, but it’s true. It’s a great space to exist in, especially in Maine,” he added. When he is not working with others he seeks out great experiences in and out of the state. If the weather is right, he enjoys flopping on the beach whenever he can. He makes sure to hike Mount Katahdin and other New England peaks every summer and fall. And when the colder months arrive he tends to hibernate with books, bourbon, and his dog Cocoa. Mitch has also had the opportunity to do several cross-country road trips, he has spent some time studying in Greece, and found himself in Iceland for a week recently. With his broad range of knowledge and experience, you will truly enjoy the chance to talk with Mitch aboard one of our tours. Favorite Playtime Activity (aka Hobby) – I love zipping around Portland on my bicycle in the summers, and flying down trails on my snowmobile in the winter. I also enjoy doing performance work on my vehicle and drag racing it in NH, although I’m still working on convincing the Brew Bus to let me install nitrous systems on all of our buses. Favorite Part of Being a Driver/Guide – Trading stories with people is one of my favorite past times. I’ve lived a brief but beautifully strange life thus far, and I love drawing connections and sharing those weird experiences with others. Usually, this gets people sharing their own and I love to hear all about what they have to offer. Favorite Experience with a Guest – I met a fellow metalhead on a tour recently, and it was a lot of fun to share different bands with one another and different venue destinations as well. I’m still fairly new to the Brew Bus, but I also hope to convince more and more people to join me at Bubba’s Sulky Lounge afterward, and party like it’s the 80s again on the light up dance floor. 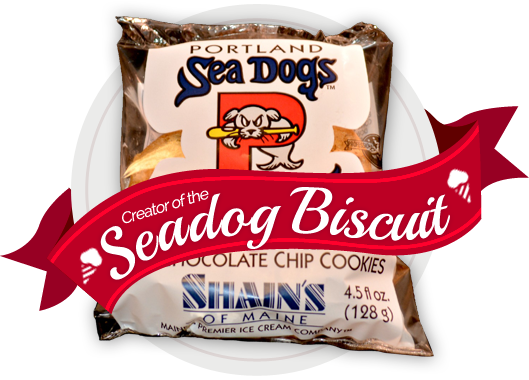 Favorite Snack – Sea Dog biscuit for sure. Also, dark chocolate peanut butter cups. Favorite Movie – Surf Ninjas–part of the 90s ninja craze featuring a red-headed Rob Schneider, Leslie Nielsen as an evil cyborg general, one-hit wonder Tone Loc, and a Sega Game Gear that predicts the future (but really just shows things happening already…). Animal Friends? – I have a pit-lab mix named Cocoa and she’s fantastic. I also live with a one-eared, half-blind cat with no tail that likes to try to beat her up named Jasper and a cute mischievous kitten named Frasier. Celeb Crush – Penelope Cruz, will you marry me? Favorite Food – Fish tacos from Taco Trio in South Portland. Mitch has cracked his head open in the same spot twice, receiving exactly six staples each time. Once, during a freak game of Polish horseshoes he was hospitalized and was stitched up by the same doctor who stapled his head. Mitch has jumped out of a perfectly good airplane—twice. And he has webbed toes because…he believes that he is the missing link between humans and frog people.